Uninstall Manager is a powerful but easy-to-use Windows Add/Remove program that combines a professional range of tools to improve the efficiency and speed to uninstall your unwanted programs in batch. The more junk files your computer has, the slower it runs. Uninstall Manager can wipe off all the junk files clearly in seconds. It offers a more user-friendly way to remove unneeded applications and to improve your computer efficiency. 1.The Second Line Button: quick access button to Batch Uninstall, Uninstall checked Programs, Remove Entry or Modify Properties on the selected program. 2.The Left-hand Side Small Box: click "Recently Installed Programs", "Large Programs", "Rarely Used Programs" or "Windows Updates" to narrow down results of the search on the programs you want to find. 3.The Upper box: displays all programs with their name, publisher, size and date installed. 4.The Lower Box: shows detailed information on a selected program, such as program name, publisher, size and date installed. Uninstall Manager is an enhanced Windows Add/Remove program with more powerful functions to uninstall stubborn programs. The standard Add/Remove program can't uninstall software completely and often leaves broken registry keys, unnecessary files on the hard disk. The more junk files on your PC, the slower it runs. 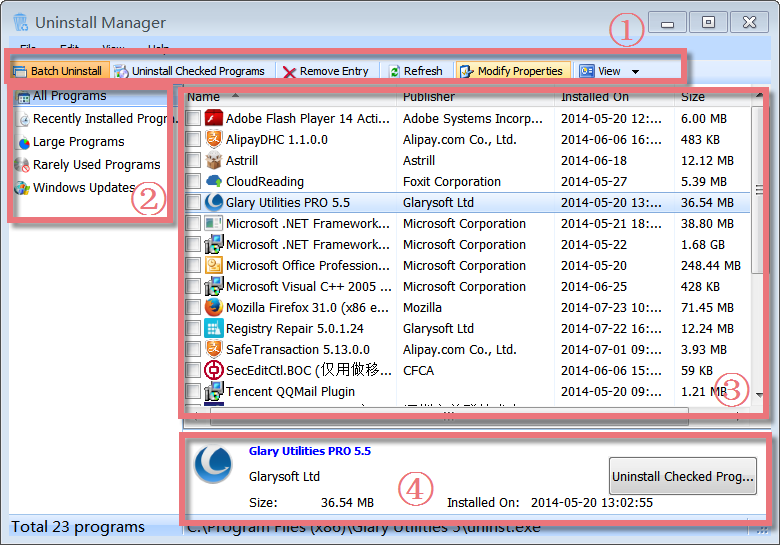 Uninstall Manager can clean up all the junk files totally in seconds after uninstalling software. It provides a more user-friendly way to remove useless applications and to enhance your computer efficiency. Uninstall Manager supports batch uninstall and helps to remove multiple applications from computer system with a single click, which is much useful for those people who like to try all kinds of applications. Uninstall Manager also allows you to make backups for certain programs in case of mistakes. What's more, it won't ask for system reboot each time after uninstalling an application like other similar software. To easily uninstall multiple programs, after you start "Uninstall Manager" and click "Batch Uninstall", you can check up the program that you want to uninstall. Once you have checked, you can click "Uninstall checked programs" in the second row of main menu and choose "Yes". Uninstall Manager is a specially-designed utility used to remove programs completely from your computer easily, fast and completely without leaving any junk data. Uninstall Manager marks a red "New!" on the right of applications you have installed recently. This feature is very convenient for finding and uninstalling useless programs that users installed them recently. Uninstall Manager allows users to back up uninstall information, export list of installed applications and restore removed entries. Users are even allowed to modify properties of applications. The unique feature of Uninstall Manager is that it can autofix invalid entries and make Windows system error free and smoothly. For later use or some unforeseen problems, you can backup/restore uninstall info before you have removed entry. You can quickly backup/restore uninstall info with Uninstall Manager. First choose the program you want to backup/restore, and go to File->Backup/Restore Uninstall Info->choose a file to backup/restore. If you want to find "Recently Installed Programs", "Large Programs", "Rarely Used Programs" or "Windows Updates", just click the entries on the left panel. It helps to narrow down results of the search on the programs you want to find. Uninstall Manager allows you to auto-fix invalid entires. If you want to auto-fix invalid entries, you can go to Edit->AutoFix Invalid Entries. If all the entries work well, it will tell you: All programs installed on your system are OK, no invalid entires found. On the description panel, click the column heading you want to sort by. To reverse the sort order, click the column heading a second time. You can sort the list of files and folders by Name, Publisher, Size and Date Installed. Click "Uninstall" under Programs, Uninstall Manager will pop up. Find and click Uninstall Manager icon in the Dock bar, Uninstall Manager will appear. If Uninstall Manager is not in the Dock bar, click in Dock bar, Uninstall Manager will show in a new pop-up window. Please note: if you want to add Uninstall Manager in the Dock bar, click in Dock bar, remove any icon by dragging it out of the Dock firstly, and then drag Uninstall Manager in.